Hanger manufactured in beech Wood with measurements 70 x 32 mm. and peg of 15 x 25 mm. Wooden hanger with measurements 80 x 47 with peg of 15 x 25 mm. Hanger manufactured in pine wood with measurements 80 x 40 mm with peg. Small hanger manufactured in pine wood with a ball finish and measurements 45 x 22 mm and peg. Hanger manufactured in pine Wood with flat finish and measurements 50 x 45 mm with a 15 x 25 mm peg. Small hanger manufactured in beech Wood mushroom shaped with measurements 60 x 15 mm with bore. Baluster shelves turned, manufactured in beech wood with threaded bore for screw wooden thread. Available in 3 Lengths 21, 26 and 31 cm. Thickness 2 cm. Baluster balls turned, manufactured in beech Wood with bore and peg. Available in 3 Lengths 32, 37 and 42 cm Thickness 3.5 cm. Baluster taquillon turned, manufactured in beech wood with 2 pegs Measurement Length 12 cm and Thickness 1.5 cm. Balusters magazine racks turned, manufactured in beech wood with 2 pegs. Available in 2 Lengths 25 and 35 cm Thickness 2 cm. Turning baluster railing made of beech wood with spikes. Measure 40 mm long. + 0.5 mm spikes. part diameter 20 mm. Baluster for large railing jar with 2 spigots made of various types of wood, beech, pine and oak. Long measure with spikes 7 cm. Ø 1,5 cm. , Only turning without the spikes has a length of 5.5 cm. 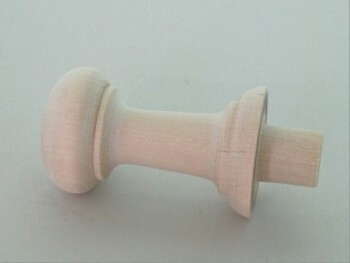 Small baluster made of pine wood. Long measure with spikes 4 cm. The piece has Ø 1 cm. Only turning without the spikes is 3 cm long. Thick baluster with turned spikes made in Oak. Long measure with pins 70 mm. Ø 35 mm. , Only turning without the spikes has a length of 5 cm. Baluster small jar shape for handrail with 2 turned spikes made in various types of wood to choose beech and pine. Long measure with spikes 8 cm. The piece has Ø 2 cm. Only turning without the spikes has a length of 6.5 cm.